1. Line your cookie sheet with foil. Place your candy in a circle making sure that all the candy is touching. 3. 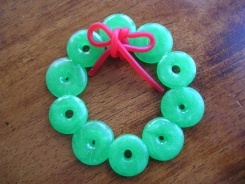 Once your wreath is cool, peel off the foil and tie and licorice bow through one of the holes.